"Becky Bopp’s The Everything Restaurant Recipes Cookbook couldn’t have come at a better time. Filled with copycat recipes from my favorite places to dine, I can now have the experience of eating at a five-star restaurant without ever leaving my home. Especially in a time of economic struggle, when some days I simply cannot afford to eat out , this provides a great alternative for those penny pinchers out there, like me, that still want to have a great dining experience. From the first to the last page, Becky Bopp made me feel like I was in the kitchen line creating wonderful dishes for my family. In the intro she wonderfully explains everything you are going to need to make your perfect entree. Her description is as extensive as the tools you are going to need, to the spices that you may want to purchase, to even how to correctly pick out meats and vegetable at the supermarket! With every word I felt as though I was in a famous culinary school learning the trades and crafts of a professional. In my head I was becoming, one of my heroes, Julia Child! The book even explains how to properly plate your food for the best presentation. And let's face it, in some cases, presentation is everything. I was already in love with the book before even getting to the recipes! The book has a total of fifteen chapters, each specializing in different areas of food. Chapter one, as aforementioned, focuses on the tricks of the trade. Chapter two jumps right in with Breakfast and Brunch. I immediately found one of my vices - Cinnabon Cinnamon Rolls (pg. 17)! I had to immediately make it and to no surprise it was exactly like the ones you can get at the vendor. In fact, I would go as far as to say that they were even better. Right out of the oven, I knew that they were fresh and they certainly looked and tasted fresh. The book only gets better as it progresses with appetizers, steakhouse favorites and ending on a high note, signature cocktails and drinks. This book has it all. I simply cannot think of a reason to go out for supper when I can make these dishes in the comfort of my own home. This is a great book." "Have your favorite restaurant foods every day of the week for a fraction of the price. Becky Bopp's The Everything Restaurant Recipes Cookbook has all of your favorites. Not only that, the recipes are so simple. You'd be surprised how little effort it takes to make Outback Steakhouse’s Aussie Fries (pg. 118) or their Shrimp on the barbie. Now, I've been a regular at the Outback for years and never has their food been as good as to when I made it in my own home. There is nothing more satisfying then getting your favorite meal for half the price and never leaving the house. With 300 different recipes, I don't think I will be going out for dinner any time soon. This is a great addition to my cook book collection. I would recommend you make it part of yours." "Become a restaurant chef in your own home with Becky Bopp's The Everything Restaurant Recipes Cookbook. Try to taste the difference between Olive Garden's Tomato Basil Crostini (pg. 50) and the copycat recipe of it that you can find in the book. I know I couldn't. My favorite part about Becky Bopp is how simple she makes everything seem. The recipes are so well written that even for a beginner cook, like me, I was able to understand and follow every word. As I went through the book I realized that the foods you get at the restaurant may taste like it takes hours to prepare when, in actuality, they take only minutes. Half the time to make, and sometimes, twice the flavor, all of these recipes are great! There is a wide variety of copycat recipes from a vast collection of restaurants. So, if you are looking for a specific recipe, it is probably in here." "Becky Bopp’s The Everything Restaurant Recipes Cookbook is the perfect tool for the frugal foodie or those who frequent restaurants. With the copycat recipes in her cookbook, families can afford to enjoy their favorite restaurant meals every night of the week without breaking the bank. Plus, with 300 different recipes from dozens of restaurants, readers could go almost a year without ever repeating a meal. Just try that at Applebee’s or P.F. Chang’s! With simple instructions and ingredients you probably already have around the kitchen, you can create professional meals while monitoring the nutrition of the dishes you include. Improve recipes by incorporating additional ingredients, or artfully arrange your creations on a platter for a table setting that will impress any guests far more than a restaurant would. I have always been a huge fan of P.F. Chang’s Lettuce Wraps, so I was thrilled to find that an identical copycat recipe was right there in Chapter 10 of this excellent guide. I get Chili’s Margarita Grilled Chicken every time I go, but while I would pay almost ten dollars to dine at the restaurant, I can make four whole servings of that delicious dish for less than five dollars (and frankly, I bet mine would taste better too)! The book contains recipes from Quizno’s, Olive Garden, Cracker Barrel, and Popeye’s, among many others, not to mention the chapter devoted to drinks, which contains a myriad of amazing Starbuck’s recipes. Forget a forty dollar bill for a family of four; try these phenomenal recipes instead!" "If you're a fan of chain restaurants (and let's be honest with ourselves, who doesn't have at least one favorite) then you are for sure going to love this cookbook. This text leaves no stone unturned, as it covers just about every well-known restaurant dish that you can think of. The sheer size of this cookbook is staggering, as the book has recipes for what seems like everything. This cookbook is great for those who are new to the kitchen, as each recipe is supremely clear, and all cooking terms are defined. This book will save you so much money in the long run by teaching you to view your own kitchen with the same reverence once bestowed on chain restaurant." 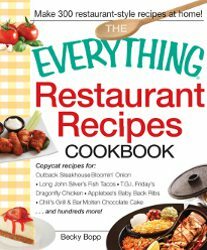 "The Everything Restaurant Recipes Cookbook is great for people who love to eat out but don't want to pay restaurant prices for yummy food! If you find yourself eating at Olive Garden or Chili's every other week just to get a taste of your favorite foods, then it's time to learn how to make these delicious recipes at home. With the recipes in this book, you can make dishes that look and taste like popular restaurant dishes. I never thought I could make a Bloomin' Onion just like the ones at Outback Steakhouse, but it turns out it's not that difficult! I also found one of my absolute favorite restaurant recipes in this book: Southwestern Eggrolls from Chili's. I can't wait to make these crunchy, spicy eggrolls at home!" Thank you for the wonderful review of my cookbook. I am planning more in the future.